Three Domed Telescopes Create A Stunning View Of The Night Sky! Used for inquiry and education, our Observatory telescopes – 36″, 18″ and 14″ in size – allow both amateur and professional astronomers to conduct research, while visitors gain first-hand knowledge of the beautiful and awe-inspiring sights of the night sky. The 36-inch Gueymard Research Telescope is one of the largest telescopes in the US that is regularly available for public viewing. A Ritchey—Chretien design, the telescope features hyperbolic primary and secondary mirrors which sharpen the image, eliminating the fuzzy edges around its center, what is known to astronomers as an off-axis coma. With optics this precise, the telescope brings to the naked eye the phenomena of deep space. 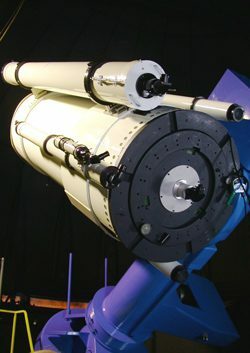 Mounted on the main 36” telescope are two refractors. One is a 6” from Parallax Instruments. The 11” refractor was generously donated to the George Observatory by Preston Engebretson. Mounted on the side of the 36” reflecting telescope, this refractor has near perfect lenses and offers stunning views of the planets and solar system. Housed in the West Dome is a completely computerized 14” Celestron Cassegrain telescope on a Paramount driving platform. In the East Dome is the 18” fork-mounted equatorial Newtonian reflecting telescope. Depending on the time of the month and the season of the year, visitors are able to observe a variety of phenomena, such as Saturn’s rings, cloud belts on Jupiter, a partial or total eclipse of the Moon, a bright meteor or fireball that lights up the ground, the Milky Way, or a close pairing of two planets. Stargazers can look at the night sky through George Observatory’s telescopes, far away from the light pollution of the big city. It is truly a sight you won’t want to miss. Telescope tickets are on sale at the George Observatory Gift Shop. Because stargazing is weather dependent, tickets may only be purchased in-person.